the scent of green bananas: oxtail soup, hawaiian-style. sorta. Posted by santos. This entry was posted on 20060404 at 8:29 PM You can skip to the end and leave a response. oooh i love a good oxtail soup. my mum used to make her soup/stew in a pressure cooker and on days when she worked and had uni in the evenings the crockpot would be put to work, so that us girls would have something to eat after school. i must say i really like the guam version, so much more fresh herbs through it. i'll give this a go some time in the next few weeks as i have a crock pot which needs some attention. Fine work there Santos. Will try and report back forthwith. Only thing is - I have trouble convincing anyone in my household, apart from the greedy toad, that oxtail is a year round dish regardless of the stinkingly hot climate we find ourselves in for much of the year. This looks like something I would love, the use of lemongrass is such a good idea in this recipe but lemon leaves would be ifficult to find here. This is more like vietnamese noodle soup. But this is more colorful. Eee! Excuse me while I gush, here. I found your blog while Googling "spam musubi", and am enamored! EEeee-namored! I'm *so* impressed with the pictures you take of your food. I made your Paradise cake using fruit purees (a vendor from work totally hooked me up, I LOVE living in NoCal, alla that gourmet stuff just lying around)--passion and guava. the lime part I did myself with zest, etc. Try infusing the whipped cream with sliced ginger, that was perfect! 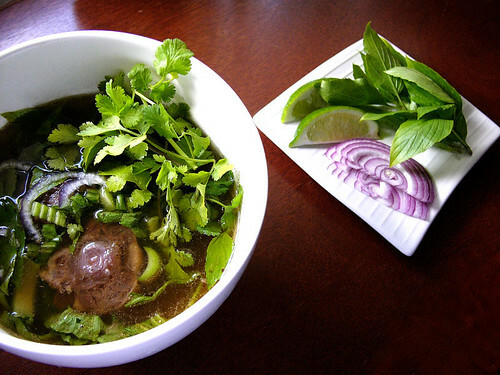 Ok, this soup looks like Pho, looks like awesome. Must try it out on my grandfather (he is from Hilo, like an OG hawaiian) when I visit later this month! love the green. makes it look extra tasty after reading it. i defintely want to try this recipe with my crockpot. Ny mother used to make oxtail soup for me every time I visited and when my grandmother learnt of it, she would make her version of it. I spent many summers eating oxtail soup and I never got sick of it! Love your recipe and photo, Santos! saff, i would love to see your mum's recipe! how was it prepared? hi ana, thanks! i'm still working on it, but it's mostly done. pieman, it's definitely never anything but summer here, so let the naysayers eat something else. actually, the broth, herbs, and veggies alone would be a nice, lighter option. oslo, i don't have a lemon tree either, so it's definitely an option. i really do like this soup with chinese dried orange peel, but i never remember to stock up when i'm in manila. use any of the three options, and you'd be good to go. anon, the recipe borrows heavily from vietnamese soups. when i'm in honolulu, usually i get this soup with grated ginger and some cilantro, but i like all the different flora you'll find with a phở. michelle, thanks for stopping by and taking the time to comment. i'm glad the paradise cake worked out for you! it's good, isn't it? super-fluffy and light. i'm jealous that you've got all those purees at your convenience! hi gustad! i agree with you on that--all the greens make the soup better for me. maria, i hope you have a big crockpot! i have made this in a regular pot, crock pot, and pressure cooker. the broths come out slightly different in each (the crock pot version comes out cloudier), but it's no less tasty. hi mm, i would love to see your family's version of it sometime! i love oxtail, and really don't know too many recipes for it; i'd love to expand my repertoire. Wow, much more sophisticated and cospmopolitan then the simple Kap version, but look very wonderful indeed. I grew up calling it peanut soup. love the new template santos! hi flygirl--thanks for your vote of confidence! Whoa Baby - Looks great, and even a mention of Kapiolani Bowl! No peanuts though? I was wondering if you could debunk (or validate) a cooking method...my mom heard from someone that placing a pair of spoons into the soup as it cooks makes the meat more tender. She tried it, and claims that it works...? hi j! love your new look, too! white is the new black. hi rabbit, glad you like this better. kirk, i would've added peanuts to this recipe if i didn't have a 500 word count limit for the article--if i had at least 50 more words, i would've definitely added peanuts! This one makes me hungry..! hi chanit! thanks for stopping by and taking the time to comment! Santos, OK, I will try to post the oxtail soup one of these days. Am now on a lamb and chicken kick. I think lamb because Easter is coming and I've got the song Lamb of God stuck in my head and chicken because ... well, they had a sale at the market. LOL. I always use oxtail for kare-kare and nilaga cause i don't know other recipe using oxtail. Now, I can try this one. I haven't made oxtail soup in such a long time because even though I like it, I can't eat the entire pot by myself. This sound wonderful though and I wish that I had made myself a pot last month when we got all that rain! hi jmom! i've never actually been to king's--i'll have to try it when i'm in la next. mm--it must be the season and the sales, because i've been eating a lot of lamb and chicken lately as well. hi lani--i don't know any recipes for oxtail except kare-kare, nilaga, and this! i wish i knew more. reid--a full pot is way too much, isn't it? still, it's good when you can get it. Thanks for the recipe. I used to fly for Philippine Airlines as a cabin crew and after a tiring 8-hour flight from Manila, I used too relish the YMCA's (near Ala Moana Hotel) version of the soup. I will definitely try it- I am certain it will bring back pleasant memories. This looks PERFECT, thank you! I wanted to make something special and savory for a friends birthday. This is IT - I can taste it in my mind and I'm really impressed. My friends and I are big fans of down-home food - but since its a birthday I was looking for something "more." this will make a spectacular starter. wow, that will be a great birthday meal. your friend is very lucky! We're making oxtail soup now. Thank you for your great tips. Sounds delicious! !